Twenty years ago, you could walk into an office and not see one piece of the IT equipment we rely on today. They had these things called typewriters—remember them? Today’s industry relies heavily on high-end technology keeping us connected and working as efficiently as possible. Servers, computers, and printers are a vital part of your company’s daily work routine. 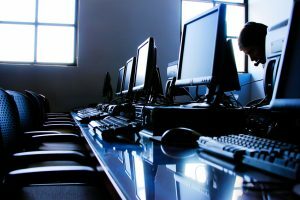 Even small businesses should consider finding an IT Relocation Specialist to assist in the moving and setting up of your IT network in the new location. These professionals are trained to effectively get your business back online. Before handing over something that is valuable to your company, you need to find a vendor that best suits your IT needs. 1. Most companies have an IT person onsite or a contractor who works with their IT systems on a regular basis. It is key to have this person on-hand during the IT relocation process. This person knows your system inside and out, so he or she will be able to provide all of the pertinent information and answer questions about your IT system when choosing a vendor. 2. Find a company that can handle all details of your IT move. They should be able to include servers, computers, phones, and every item on your office network. If you have only one company servicing your IT relocation needs, then you will have fewer cooks in your IT kitchen. 3. Because of the information saved on your company’s server and computers, you need to be able to trust the people moving your technology. Meet with the company and also perhaps someone who will be directing your move. Make sure all IT specialists are certified and experienced in working with your existing and new systems. Also, try to find reviews online or get recommendations from business colleagues. 4. Since your IT systems will be shut down during the move, your business will be temporarily offline. Have a reasonable time frame in mind when meeting with potential IT relocation specialists. See if they can meet your deadlines. Don’t let them tell you how long it will take (within reason). 5. Make sure the potential vendor is fully insured, just in case. You always have to plan for the worst case scenario, and hopefully you will never have to use it. Your IT Network is ready for a smooth move, but is the rest of your business? Don’t forget a single thing! We'll teach you how to relocate your valuable IT equipment safely. Get Your Free IT Checklist!